Famous as the leader of the pro-Union and anti-Home Rule Ulster Covenant campaign of 1912, and the founder of the Ulster Volunteer Force which would become the famous 36th Ulster Division, Edward Carson was elevated from Ulster politics to become an influential figure on the national stage during the Great War. a company half a dozen Irvines or Johnstons, a battalion half a score of Morrows or Hannas”. 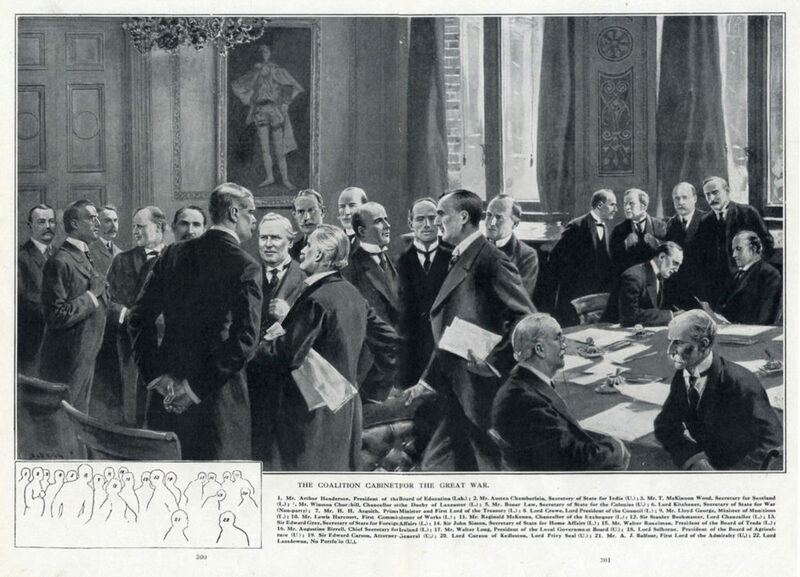 On 25 May 1915, Sir Edward Carson was made Attorney General in the government of H.H. Asquith. “They were my own boys. They had been with me for many a long day training for purposes which I need not go into. Suffice to say when war broke out I went over to them and said “England’s difficulty is our difficulty; England’s sorrows are our sorrows and England’s triumphs must be our triumphs”. On the same day I led 800 men as pioneers of the Ulster Division myself into the recruiting office. There was hardly one of them I did not know personally. Many an honest hand that now lives no more has shaken mine. The 1st July is an historic date in the history of Ulster, and it has become more historic through the events of last year”. However Carson resigned from government on 19 October 1916, dissatisfied with how Asquith was handling the Great War. It was a strategic move, planned with David Lloyd George and Andrew Bonar Law (who was of Ulster-Scots descent and who would later live in Coleraine for a time). It had the desired effect when just six weeks later Asquith himself resigned. David Lloyd George became Prime Minister and he reinstated Carson to high office by making him First Lord of the Admiralty on 10 December 1916, a position he held until 17 July 1917. Carson’s predecessor in the role was the pro-Union Arthur Balfour; the two men had shared anti-Home Rule platforms just a few years before. Balfour had stood in for Carson at a rally in Aberdeen in November 1913 which drew an audience of 3000 people. During Carson’s tenure, he oversaw the Royal Navy’s battles in the Atlantic with German submarines and encouraged the development of anti-submarine technology. He supported the use of convoys across the Atlantic to ensure links between Britain, Canada and the USA were protected. During the Great War Carson’s son, Walter Seymour Carson, served in the Royal Navy, eventually commanding a submarine. In a speech in the House of Commons in February 1917, Carson gave a 1 hour 20 minute speech on the work of the Navy, reporting the loss of a total of almost 100 British ships in the previous three months. His former Home Rule opponent, Major Winston Churchill, suggested that Carson may have been exaggerating the scale of the “submarine menace”. After leaving his Admiralty post in July 1917 Carson remained a member of the War Cabinet and Minister without Portfolio. This message was included on the inside back cover of the official 1919 publication Ulster Greets Her Brave and Faithful Sons And Remembers Her Glorious Dead, which is available to download on this website.